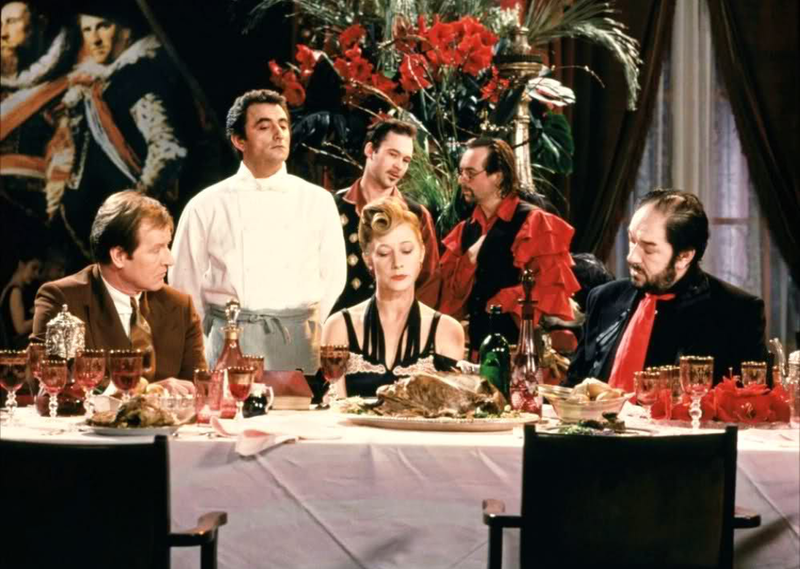 IF you are not already aware of Peter Greenaway's work, THE COOK, THE THIEF, HIS WIFE & HER LOVER, despite the lengthy title, is a good place to start. Greenaway is an art lover first and foremost and his films owe much to renaissance art, evidenced in the living tableaus he constructs. This film, in particular, is also heavily influenced by Jacobean tragedies, of which Greenaway is well versed, specifically the revenge tragedy genre. It is this aspect that makes the feature more accessible than much of his work. But do not be fooled; even an accessible Greenaway film can challenge the mind or, more importantly for this film, the senses. There is much to gorge on here: stark colour choices alter the costumes (designed by Jean-Paul Gaultier) from room to room; a sublime score; excellently well framed cinematography; a cast littered with familiar faces. The most sumptuous of delights of all these features arrive in the form of the lead performances, such as Helen Mirren's long suffering gangster’s wife Georgina and the vile thuggish mobster boss Albert Spica, played masterfully by Michael Gambon. Rarely on film has a loveless marriage been played so convincingly. Georgina is broken, tired, she finds no solace in her husbands “treats” because she is his prisoner. Yet she is also the only figure in Spica's life who is brave enough to stand up to him, even though she knows there will likely be consequences. An escape, of sorts, arrives in the form of a regular at Spica's restaurant. Michael (Alan Howard) appears to consume more literature than he does food. Georgina makes regular visits to the bathroom, where she and Michael carry out a passionate, dangerous love affair in short bursts. Albert Spica is a foul beast of a man, an ogre who consumes everything around him. He is short tempered, always loud and abrasive and invites little empathy. Even upper middle-class diners cannot escape his tyranny as he smashes crockery without a second thought. Gambon’s performance is both hammy yet frighteningly real. French head chef Richard Boarst (Richard Bohringer) is the axis around which the primary characters spin. It quickly becomes clear that Boarst's restaurant was not sold to Spica willingly. Despite this, Boarst is able to tame Spica's rages, even changing his mind from time to time. Boarst shares a dialogue scene with Georgina towards the end of the film in which he sums up the philosophy of the film through discussing his food. He charges the most for anything black - olives, caviar - because to consume the colour black is “like consuming death”. Here we come to realise that food is part of the narrative, all culminating towards a satisfying denouement in which this revenge tragedy draws its themes to a close. THE COOK, THE THIEF, HIS WIFE & HER LOVER is not a dish to be eaten lightly. It may even churn your stomach at times. But, while the beauty of this work may be overwhelming at times, it gives us a lot to ponder.